Each day the sun comes up later, the dogs are quick to get outside and back in to the heated throw they enjoy each morning. The resident front yard frogs have gone off to their winter hiding spots and the toads from the back porch have not been seen. 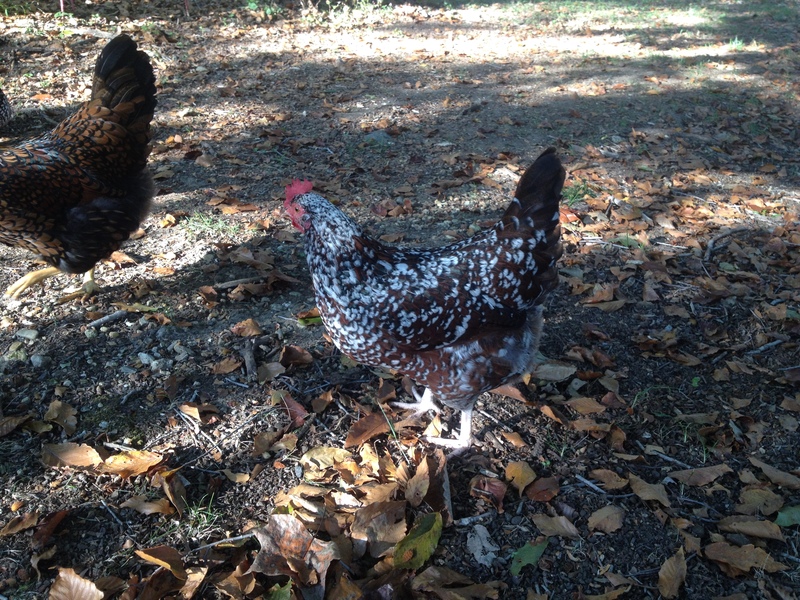 The only group here on the farm that hasn’t figured out that that fall is here are the chickens. Each day I wake them up and free them to their yard for a day of chicken fun. They have further fun when Jon lets them all the way out later in the afternoon. They fly, yes fly down to the chicken spa for a quick but necessary dust bath. After that they rearrange the flowerbeds, removing all the mulch, weed under the trees and make sure that the bugs are cleaned up off the front porch. They have a very busy schedule. I often return from work after dark. Jon has put them back in their house but leaves the light on so that I can put them to bed and have a chicken chat. This while not a fun as summer when we get to hang out for hours after work I still get my fix and they get to tell me all about their busy day. Welcome Fall I am glad you are here easing the change into winter. This entry was posted in Uncategorized by aebg12408. Bookmark the permalink. I love chicken chats, they have so much to say. Can get a little snarky but they are hilarious.